The Short Version: Kuma’s Corner, based in Chicago, is not your average burger joint. Instead, Kuma’s serves up burgers made with bold ingredients for daters who are looking for something a little different. At Kuma’s, diners feast on burgers with names like the Slayer, the Black Sabbath, and the Iron Maiden, while they listen to piped-in heavy metal music by the bands that inspired those names. Those music-inspired dishes don’t sacrifice flavor for novelty, either. Kuma’s offerings have received accolades from foodies both in Chicago and around the country. 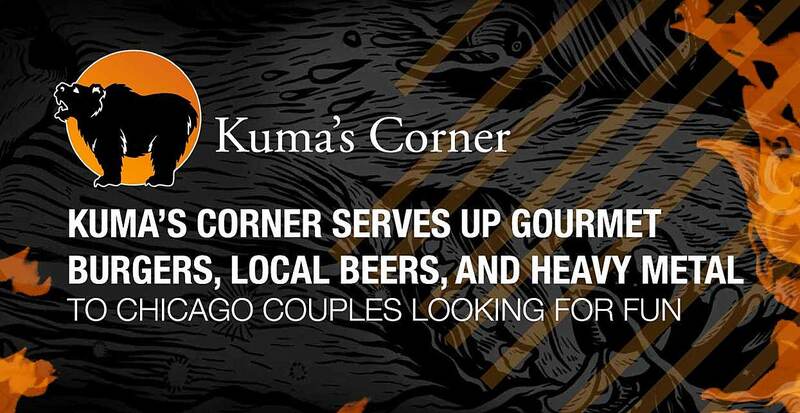 People who take their dates to Kuma’s Corner in Chicago will learn at least two things about them: whether they’re adventurous eaters and whether they’re fans of heavy metal. The restaurant, with locations in Illinois and Indiana, serves up both gourmet burgers and pumps a healthy dose of metal music through the air. Many of Kuma’s burgers get their names from some of the most famous bands heard playing through its speakers, including Black Sabbath, Metallica, and Mastodon. Behind the names are carefully crafted recipes that attract burger lovers from all over. The Black Sabbath is a blackening spiced burger with chili, red onion, and pepper jack, while the Metallica is topped with buffalo sauce, blue cheese dressing, bacon, lettuce, tomato, and onion. Kuma’s Corner is a great place to take a date, especially if he or she like burgers and heavy metal. Kuma’s has earned a unique reputation and has distinguished itself from other burger joints in the Windy City. According to Kuma’s President Ron Cain, one of the main reasons is that everything on the menu is fresh. The restaurants don’t even have microwaves or freezers. What’s more, many burger staples that other eateries purchase are made in-house at Kuma’s every day. That includes all of the sauces and condiments (even ketchup and mustard). Kuma’s also has craft beer and whiskey from local and small breweries on tap as often as possible, but perhaps the most unique aspect of the restaurant is its ambiance. “We play heavy metal music. Loudly,” Ron said. “We completely changed the theme of the restaurant to focus primarily on gourmet burgers named after metal bands,” Ron said. Soon after the switch, Kuma’s began developing a community of devoted diners. To meet — and exceed — their expectations, restaurant owners sought out staff members who were committed to creating a memorable experience for everyone. Kuma’s uses only fresh ingredients, and its restaurants don’t have freezers or microwaves. “We have an eclectic group of individuals in our family. Musicians, professors, derby girls, artists, and all around badass human beings,” Ron said. The team has become particularly close-knit through regular staff parties where they get to know one another better, and the restaurant is closed on major holidays, so team members can spend more time with their families. This community atmosphere also translates to the restaurant’s commitment to the cities it calls home. Every month, the team donates a portion of its proceeds to a local charity. These have included organizations like the Muscular Dystrophy Association (MDA) and the Merit School of Music, a music school in Chicago that serves students of all ages. Diners can ask their server about the charity of the month if they’re interested in contributing. In addition, Kuma’s aims to support local companies when purchasing the menu items it doesn’t produce itself. One example is the team’s desire to promote small and local craft brewers over nationally-distributed beers. With a focus on developing community, Kuma’s attracts diners from all walks of life. Many couples choose Kuma’s for a date night or as a place to get to know one another. The restaurant offers a casual experience that doesn’t require fancy attire, but it’s not a sports bar. “If you come here, your date will not have their eyes fixed on the game on the TV but instead will be staring into your eyes while Slayer is jamming in the background,” Ron said with a laugh. The restaurant keeps local beers on tap and the atmosphere light for diners. He said many customers make Kuma’s into their regular date spot because the restaurant leaves such an impression on them. It also works well as a regular spot because the menu is always changing. Each location offers a Burger of the Month that honors another heavy metal band. If you’re gearing up for a date at Kuma’s, you’ll have plenty of options. For adventurous eaters, Ron recommends the Sourvein, which is chicken and waffles on top of a burger with raspberry aioli and a maple syrup drizzle. The Sourvein has even won the people’s choice award at the Chicago Gourmet festival’s Hamburger Hop cookoff. “We know people are excited to come to Kuma’s and, consequently, we want to ensure people have a great time,” Ron said. Though Kuma’s Corner earned its reputation by serving discerning Chicago diners, its concept has proven popular in many other cities. Kuma’s has grown to four locations in Illinois in its nearly 15 years in operation: two in Chicago, one in Schaumburg, and one in Vernon Hills. It has also added a fifth location in Indianapolis. Kuma’s is expanding its reach well beyond the Midwest, though. The team plans to open a location in Denver later in 2019 with plans to continue adding new locations annually. Though Kuma’s will have opened seven locations in fewer than 15 years, Ron doesn’t take the restaurant’s success for granted. If Kuma’s Corner seems like an ideal date-night experience, you can grab an Iron Maiden or a Led Zeppelin if you’re near one of its five current locations. Or find one in your neck of the woods soon. The staff will welcome you with open arms — no matter how you feel about heavy metal. “Some seek out Kuma’s because they’re into metal, beer, whiskey, and tattoos. But everyone comes to Kuma’s for our amazing food,” Ron said.